From an investor’s perspective, SaaS companies have a lot to love: High gross margins, predictable (recurring) revenues and capital efficient operations. On the flip side, most of them follow a common thread when it comes to growth. It might be too much to label it the ‘long, slow SaaS ramp of death’, but their revenues tend to develop slower than those for consumers plays. How come? In contrast to B2C companies like Uber, Delivery Hero or Homejoy for which it was critical to get the unit economics right, scaling distribution is usually the toughest challenge for a SaaS startup after it has found product / market fit. And this is understood by the markets. At this point I want to stress that clearly all revenues are not equal and due to high margins, customer lock-in and predictability, $1 in SaaS revenue is really something else than say $1 in e-commerce revenue. But it’s fair to say that historically IPO prospects in the B2B field could not match the explosive revenue growth of successful B2C companies. 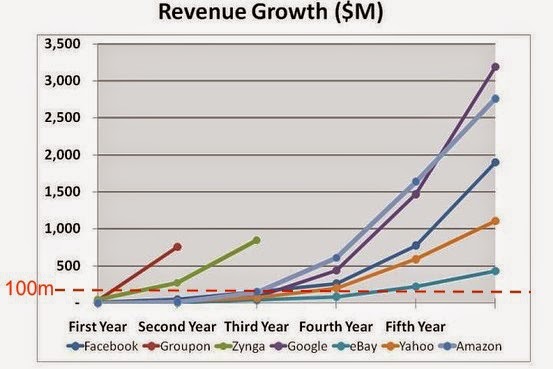 You guessed right, they are all SaaS businesses. 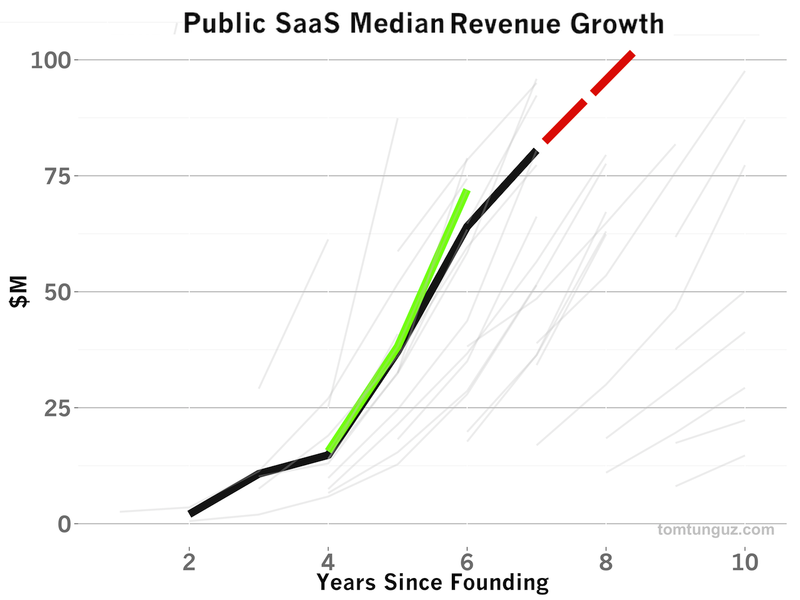 And while you could argue that the revenue growth curves of Company B and C still roughly follow the slope of a long, slow SaaS ramp of death to an IPO and come in around the median we saw at the beginning of this post ($2.5M-4.5M ARR after two years and $8M-12M after three), Company A is on steroids! It’s Slack (and B and C are Yammer and Box respectively). And while that is pretty wild, I couldn’t even fit Zenefits on there properly, because with $20M ARR in under two years and a goal of $100M after three, it’s literally off the charts. Admittedly, I can't say for sure that this reported 'ARR' is net revenues or what exactly their COGS structure looks like, but either way their pace is incredible. 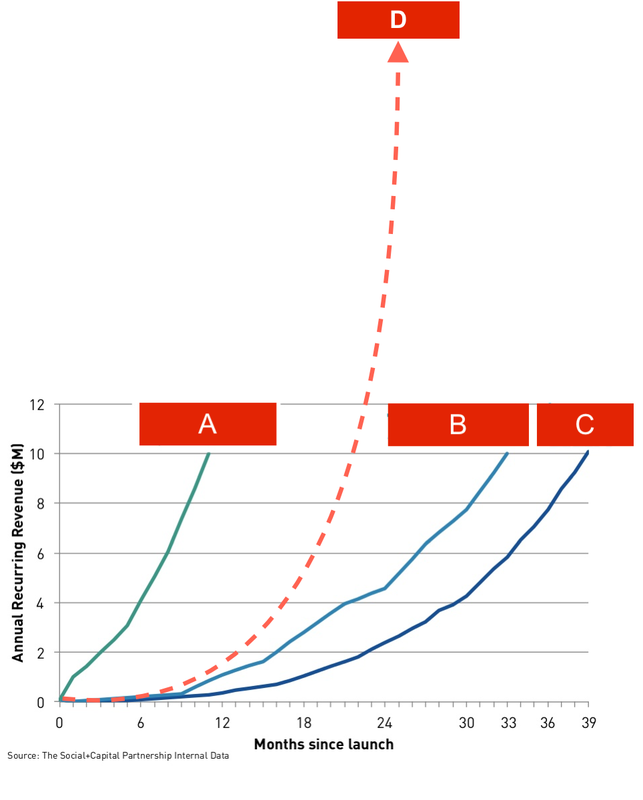 Are we starting to see SaaS companies taking shortcuts and adopting consumer growth curves? Let’s quickly take a look at these two examples and see what they did differently. You are probably using Slack, but if not just have a look at the twitter love they get. Yes, looks like they are the hottest thing on the block since KoolAid. Although I am personally not 100% sold on all design choices, the way it handles integrations and plays nice on all platforms is quite impressive. I am sure that word of mouth and referrals are the key traffic drivers for them. Second, it’s free. At least until you hit 10k messages. And by then it is likely that you are already locked-in. So are you going to become a paid customer? What if you commit to Slack now, but your team slowly drops off and you pay for these users anyway? Fear not as Slack will only charge you for monthly active users! Pretty clever, huh? How much are you paying for your HR software right now? How about $0, plus you can manage benefits through the platform with a few clicks? Hard to deny that value proposition (although we believe that this is not one-size-fits-all and best of breed solutions like our portfolio company Humanity will win large parts of the market). So they ‘just’ had to push that value proposition into the market. And with push, I mean push real good, as according to LinkedIn, there are over 100+ people in sales roles at Zenefits. And that’s a company in its second year! Compare that to Atlassian or Zendesk, which didn’t have a proper salesforce until they reached thousands of customers. It’s important to note that both cases here are horizontal SaaS solutions that are attacking broad markets. I haven’t seen a vertically focused cloud company scaling this fast, but who knows what the rest of 2015 holds. I’m curious to see how this new playbook for hyper-growth in SaaS develops. In the last few weeks I talked to two entrepreneurs who both recently made a hire that didn't work out. In both cases I asked how the reference calls went, and in both cases the answer was that they hadn't done any before hiring the candidate. This made me almost angry, especially because the two entrepreneurs are fantastic founders who could have saved themselves from this costly mistake by following a simple rule: Don't hire people without taking references. Bad hiring decisions are among the most expensive mistakes that you as a founder can make. According to this CareerBuilder survey, bad hires typically cost companies as much as $25,000-$50,000, but the true costs go much beyond cash. The (harder to calculate) opportunity costs – the fact that you've wasted time getting the wrong person up-to-speed and that your recruitment of the right candidate got delayed – usually weigh much stronger, not to mention the negative impact which a bad hire can have on your team, customers and partners. "Based on the candidate's CV and my interviews I'm so confident that he/she is the right one, reference calls aren't necessary." Assessing candidates in an interview is hard. Coming across as a great candidate in an interview process is one thing, being able to do the job is sometimes something different. Talking to people who have closely worked with the candidate for years gives you valuable additional data points for your decision. Even if you're a fantastic interviewer and you're right most of the time – if reference calls help you reduce the number of times you're wrong, they are worth it. "I won't learn anything new, and the references provided by the candidate will only say great things anyway." Even if people provided by the candidate will usually (but not always!) give a glowing reference, by asking the right questions you'll often find out, usually between the lines, if the reference-giver wants to be polite or if he really thinks that your candidate is awesome. Even more importantly, you should always try to get backdoor references, too. "It costs so much time!" Yes, it does. But think about the difference which the right hire vs. the wrong hire can make. "It's awkward to ask people for references or to sniff around to get backdoor references." Don't be afraid to ask even if it makes you feel awkward. Senior candidates expect you to ask for references anyway, and junior candidates will quickly learn that it's a standard practice. People will also understand that you need to take backdoor references. The only really problematic situation is if references from the candidate's current company are crucial for your decision and the candidate didn't give notice to his current employer yet. In that case you obviously can't simply call the candidate's boss and you need to find out carefully how you can get your references without doing harm to the candidate. If I was able to convince you of the "why", check out this great post by Mark Suster about the "how": "How to make better reference calls"
Growth is the single biggest determinant of startup valuations at IPO, as my fellow SaaS investor Tomasz Tunguz concluded based on an analysis of 25 IPOs in 2013. Growth (a.k.a. traction) is also the most important factor that attracts VCs and drives valuations in private financing rounds. Of course your team, product, technology, business model and market matter too, but when you’re past the seed stage the expectation is that these factors will have resulted in excellent growth. At the seed stage you can sell your story and vision. At the Series A and later stages, you have to back it up with numbers. This isn’t surprising. Past growth tends to correlate with future growth, and since tech markets are winner-takes-all (or "winner-takes-most") markets, investors are obsessed about finding the fastest-growing player that has the biggest chance of dominating the market. If growth is so crucial, how fast do you have to grow? The answer depends on the market you’re in and the type of company that you want to build. If you’re in a small niche market – let’s say a business solution for a small vertical, localized to one country – maybe you don’t have aggressive, well-funded competitors. In that case it may be sufficient if you’re the fastest-growing player in that market, even if that means you’re growing only 20% year-over-year. There’s absolutely nothing wrong building a company like this, and you could end up with a highly profitable small business (or Mittelstand company). This is not the type of company VCs look for though, and the rest of this post is written based on the premise that you’re a SaaS startup that wants to grow to $100M in Annual Recurring Revenue (ARR). So how fast do you have to grow in order to become a $100M company? Again using data compiled by Tomasz “Mr. SaaS Benchmarking” Tunguz we can see that the 18 publicly traded SaaS companies that were founded within the last ten years took five to eight years to reach $50M in revenues, with 14 out of the 18 being in the six to seven years range. (1) Add another one or two years for getting from $50M to $100M, and we can assume that most of these companies took seven to nine years to get to $100M. Could you also take the slow track? The big question is now if this strong pattern is merely the result of investment bankers’ and public market investors’ preference for fast-growing companies or if something more fundamental is going on here. If there was a “law” which said that if you haven’t reached something close to $5M after three years, $10M after four years, and so on, you’ll likely never get to $100M, this would obviously have important implications for founders as well as investors. As companies get bigger, growth rates tend to go down, not up. So if your growth rate in year three is only, say, 50%, it’s unlikely that it will be 200% in the following year. It can happen and does happen, of course, but only if there’s a dramatic improvement in the business - a new product, a new distribution channel, a new business model or the like. It’s hard for a slow-growing company to attract the best people. It’s not only about being “hot” as an employer (although that’s part of it, too). If you’re not growing fast, you’ll also have a hard time making compensation packages competitive with those of fast-growing companies. The positive feedback loop that is taking place here is very powerful: Momentum attracts talent and money, which you can turn into more momentum, and so on. Not so many founders have the stamina and patience to stick to their company for 10, 12, 15 years - after so many years, many people understandably need a change. And while a company can of course survive its founders, it’s still a loss that doesn’t make things easier in the future. Lastly, but maybe most importantly, if you can’t figure out a way to grow fast and you’re in a large market, chances are that someone else will. It also increases the chance of a new, innovative, fast-growing startup entering and possibly disrupting the market before you’ve reached significant scale. Coming back to the original question, how fast is fast enough? 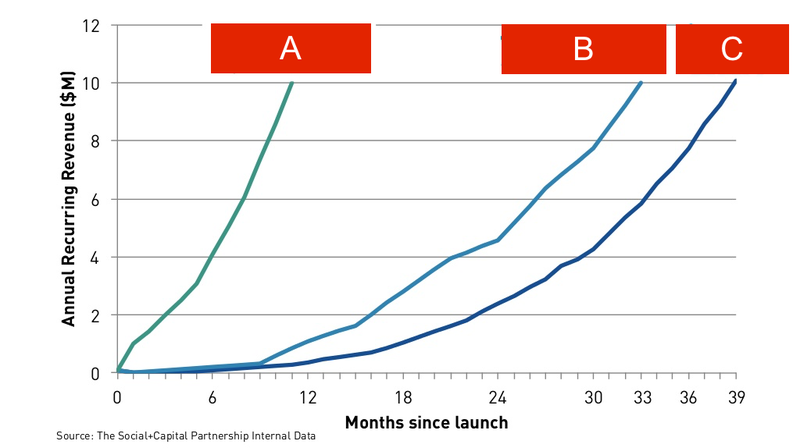 If your goal is to eventually get to $100M in ARR, I think you should try to get there as fast as possible, and getting there by the end of year seven after public launch feels about right to me. This may seem like a very ambitious goal, but it would be boring if it was easy, wouldn’t it? (1) Note that there’s somewhat of an outcome bias in these results, as companies that were founded in the last ten years but take more than ten years to go public haven’t been included. So it’s possible that a few companies with slower growth will be added in the future, but that’s unlikely to change the picture significantly, especially if you keep in mind the trend which Tomasz has described in his post: SaaS startups are growing faster than ever before, and it’s taking them less and less time to get to $50M.